I arise to a sky of subtle blue, the color of newness and awakening. Cross-hatched with the white tails of jets high in the sky, it looks like Summer seersucker gone wild. It’s a lazy Sunday morning without the typical tourist need to get up and out to see the sites and make the most of the time one has in the City of Light. My friends, Thom, Eric and I are spending more time here this trip eliminating the need for a schedule. I’ve spent more time as a visitor in Paris than any other city outside of the US. And except for their yearly trip to Taiwan, I can say the same for Thom and Eric. There’s a certain feel to the city; a lightness of step that occurs in Springtime with the mixture of days (cloudy with a bit of a chill and the threat of rain that doesn’t quite materialize; overcast but comfortable; sunny and warm where everyone is out lounging in the parks or sitting for hours in cafés). There’s a certain aroma to Paris as well. And with Spring, it’s a mixture of Hyacinth and Narcissus. 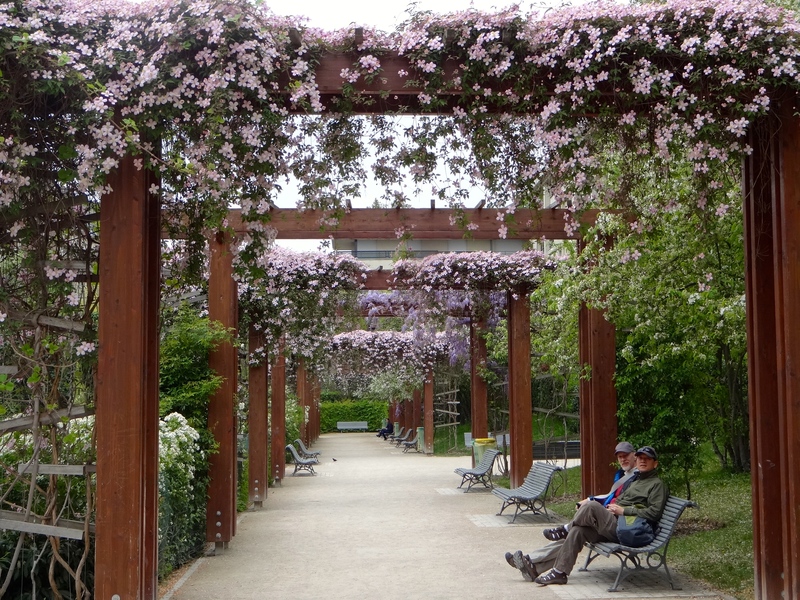 The climbing vines of Clematis contribute, although you can’t ignore the beauty of Wisteria. This fragrant Paris combines the floral with the open doors of the boulangeries, with the scent of freshly baked baguettes, croissants and Pain au Chocolat, among others. A word of caution, however … you don’t want to walk too far down the Metro platform as the Paris air changes substantially! Several years before my first trip to Paris, I was visiting the Philadelphia Museum of Art and on permanent display was a Readymade from 1919 by artist, Marcel Duchamp titled 50 cc air de Paris. The glass ampoule was purchased by Duchamp in Paris and presented to Walter Arensberg as a gift. Some would find it difficult to define this piece as art, and others would question whether it still contains Paris air, since it was, in fact, broken in 1949 and repaired in the US by the artist. However, I thought the piece completely innovative and filled with humor. I have loved Marcel Duchamp ever since. Springtime in Paris is the very best. The sites, sounds and smells tug at you from every direction and pull you into the world. Shortly after our arrival, we met up with our friend, Tracy, who was meeting her sister for some shopping before heading to Berlin for the weekend. Tracy treated us to a fantastic lunch at Chef Antoine Westermann’s Drouant. Not too far from L’Opera, this exquisite restaurant that serves traditional French cuisine is located at 16-18, place Gaillon 75002 Paris (Tél : +33 1 42 65 15 16). I ordered Des coquilles Saint-Jacques poêlées with Une fricassée de légumes printaniers. 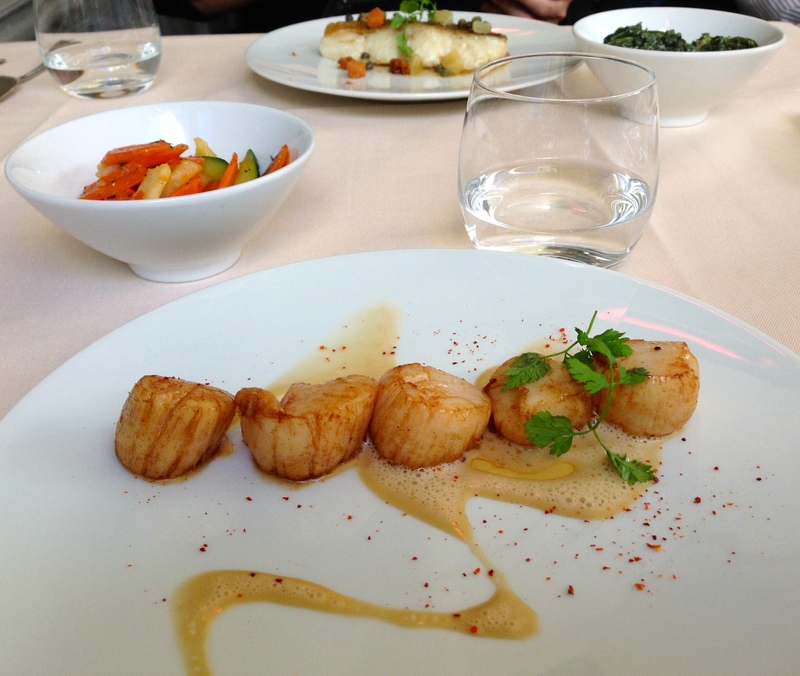 The scallops were prepared to perfection and the vegetables practically melted in your mouth. Tracy’s dessert of a dark chocolate “pot de creme,” was part of her plat complet. So Thom, Eric and I decided to split two desserts … or so we thought! We ordered Les 4 grands classiques and Les 4 chocolats. Seriously, we made the assumption that these would each be four small portions on one plate. Quelle surprise when they showed up as full size portions! Each as good as the next, they tempted us to finish them all without success. But, we gave it our best effort. It was a marvelous afternoon, arriving at the restaurant around 12:45 (early for Parisians) and departing after 3:00. The local rush came and went, but we lingered on enjoying the food and the fabulous company. It was a wonderful day and it was great to spend it in Paris with Tracy! 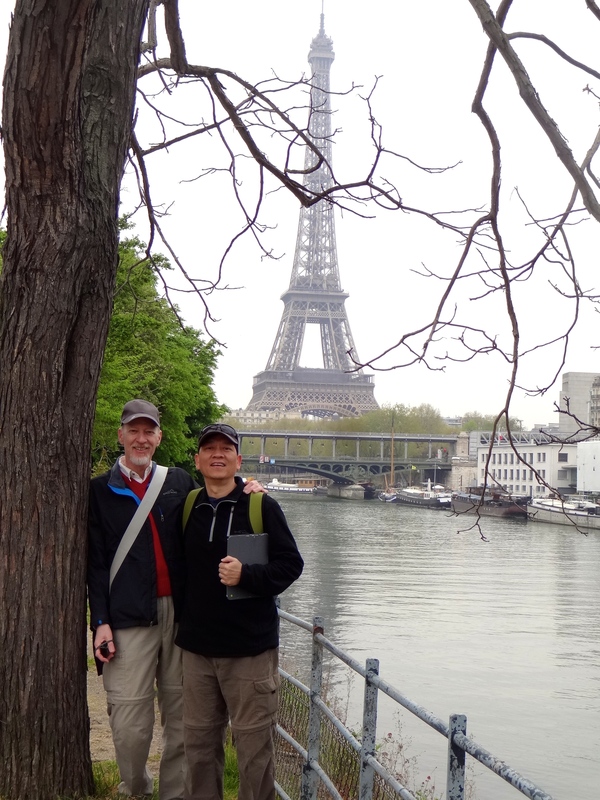 Later in the week, on a cool, overcast day, we crossed the Grenelle Bridge and entered the Île des Cygnes, an island in the middle of the river Seine. On this island facing West toward the Atlantic Ocean and its “larger sister” is a replica of the Statue of Liberty. And, toward the other end of this small island is a fantastic view of the Eiffel Tower. Thom generally goes out early and gets fresh croissants for breakfast. We purchased some locally made confiture d’abricot and figured out how to work the espresso machine. We are spending our days walking the city, strolling through parks and going to local markets where we’re purchasing produce and fresh fish and cooking our dinner at “home.” Fabulous Bordeaux’s costing approximately $6.00 accompany the meal and freshly made baguettes and cheeses from our local Fromager follow our dinner completing our days. Today being Sunday, most shops are closed. After a late breakfast, and a short walk around the neighborhood, we’re relaxing and playing Mah Jongg. C’est magnifique! This entry was posted in Paris, Travel and tagged Drouant, Eiffel Tower, Flowers, Food, Ile des Cygnes, Parc du Passy, Paris, Parks, Tour Eiffel. What a lovely old city in which to be new again! Happy to hear you through your writing. Enjoy! Thanks Candie! It’s been quite lovely! Ah, seems like the perfect way to enjoy spring. It’s been a great and lively trip! Hope all is well on the home front! Just as I remembered it! Isn’t it great knowing there is not a mountain of work waiting for you on your return! You have no idea … Oh, wait, yes you do! It’s a whole new perspective! Makes me long for our stay in Paris last August. When we were there for nine days, we stayed in a small apartment along Rue Dauphine just a couple blocks from Pont Neuf on the Left Bank. Right near where we stayed was a small side street, Rue de Buci, that was filled with sidewalk cafes and patisseries, and just a couple blocks from Blvd. Saint-Germain. Dinner most evenings was just a short walk down the street to a sometimes crowded Rue de Buci, and we tried a different sidewalk café and varied menu items almost every evening. One evening we also went to the delightful restaurant near Le Palais Royal, called Le Grand Colbert, where Jack Nicholson awkwardly met up with Diane Keaton and Keanu Reeves in the film “Something’s Got to Give”, and we actually ended up seated next to a couple from Illinois. We loved our time and the ambiance of the Latin Quarter, even though we spent most of our time exploring the various museums, monuments, churches, parks, and neighborhoods throughout Paris, as well as day trips to Versailles and Chartres. One day when we were strolling along the Left Bank area, we also found the legendary Shakespeare & Company bookstore and enjoyed browsing their extensive collection of notable French authors — a real “Midnight in Paris” moment. Hope you experience some such moments during your current stay in Paris. 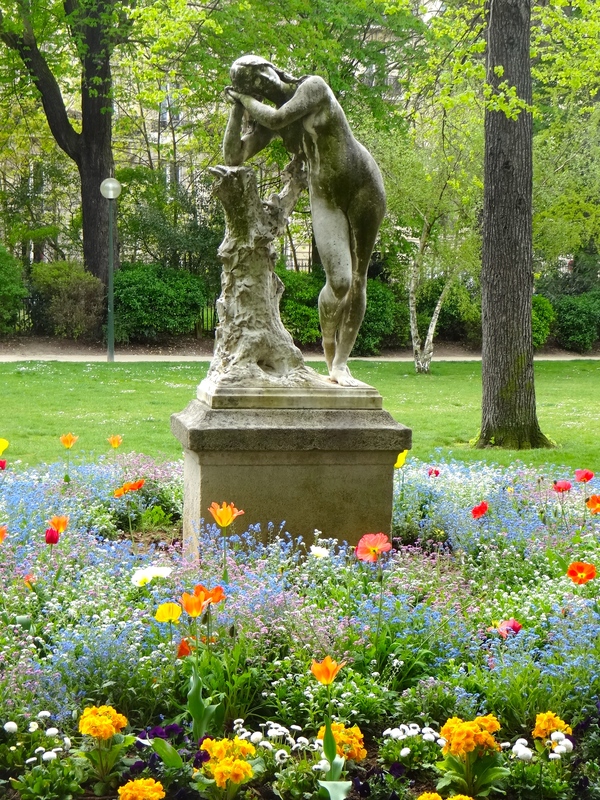 Springtime in Paris must be delightful with everything in bloom. Hope you all have a delightful and relaxing extended stay in Paris, and without the pressures of having to hurry back home to the demands of a busy job. Greetings to Thom (and Eric) and enjoy your new-found freedom! Thanks for the comment! It sounds like you had a wonderful trip last August and I’m sure you’re looking forward to your return. We’re trying to go to places that are out of the way and where we’ve not been before, but I’m sure we will return to some of our favorite spots and the Latin Quarter and the Shakespeare and Company Bookstore are a couple of them! I loved “Something’s Got to Give’ so maybe we should check that restaurant out. Thanks for the tip! Yes, definitely great to not have to stress about getting back to work! It’s been a fabulous trip! Sounds like you are having a great time yourselves! Hope Gary had a great birthday … I was in the thick of it; meant to send him a ‘best wishes.’ Take care! So glad that you and Thom and Eric are having a restful and fabulous time! Bruce and I need to get to Paris – we’ve both been there, but not together. It’s been fabulous and yes, you do need to come here together!